Altamont Country Kennels is your local pet boarding and grooming facility servicing the capital district including Albany, Schenectady and Troy. We offer a safe, comfortable and tranquil country setting for your dogs and cats. We treat them like family because they are. Gift certificates now available. Good for dog boarding, cat boarding and grooming. Large outdoor exercise areas – 15 feet by 50 feet. All dogs are provided individual exercise and play time a minimum of four times daily. Individual indoor/outdoor rooms of various sizes. All Breeds are welcome at Altamont Country Kennels. Open all year. We provide heat and air conditioning as needed. We are pet lovers and pet owners. We try our utmost to take the anxiety out of boarding your pet. 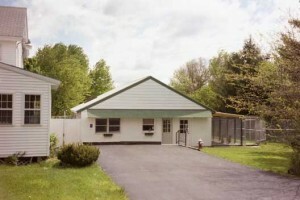 Feel free to visit our kennel for a tour during our afternoon business hours.